You may remember that I teamed up with my roommates from Camp Blogaway for a July 4th BBQ mash-up and we're at it again, this time welcoming spring with carrot cake! My creation was this - rainbow carrot cupcakes with lemon peel. What would a carrot cake be without cream cheese frosting? Just a carrot muffin?? My inspiration came from two sources: The Fearless Baker cook book which was a Christmas gift from my cousin, food mentor, and Chef - Amy and these incredible rainbow carrots from Pike Place Market. I'd seen rainbow carrots before, although never full sized ones. These were even more beautiful after they were peeled and totally blew my mind when I noticed the inside of the purple one! They even created a tie-dye look in the food processor! These cupcakes are just perfect for Easter and you can leave the artificial food coloring, neon marshmallows, and 4823 hues of jelly beans alone! The carrots brought the bright and colorful visuals, although the minced lemon peel brought the bright and sunny flavors! My first trip to Penzey's Spices was a grand success thanks to this tiny little jar. Preheat the oven to 350 degrees F and line 2 cupcake/muffins trays with paper liners. Rehydrate the lemon peel by combining 3 tablespoons of water with 1 tablespoon of lemon peel, allowing them to stand for 15 minutes. Spread the walnuts across a baking pan and toast in the oven for 8 - 10 minutes, until they're lightly golden brown. Allow walnuts to cool before cutting them into 1/4 inch pieces. Shred the carrots in a food processor. Over a piece of parchment paper, sift the flours, baking soda, cinnamon, and ginger. Add the salt to the pile and set aside. In a stand mixer, beat the butter and sugars together on low, gradually increasing the speed to medium. Scrape down the sides of the bowl, as needed. To this mixture alternate between adding the dry ingredients and eggs/vanilla, combining well after each addition. Add the lemon peel to the batter and incorporate on low speed. Add the walnuts and carrots to the mixture last, using a spatula to combine. Evenly scoop the batter into the 24 cupcake wells and bake for 30 minutes, or until a toothpick inserted into the middle of each comes out clean. Allow the cupcakes to cool completely before frosting. In a stand mixer, whip the cream cheese and butter together on medium until smooth. Add the powdered sugar, vanilla extract, and salt and mix thoroughly. Using a piping bag, top the cupcakes with cream cheese frosting. Enjoy! I couldn't be happier with these carrot cupcakes. The walnuts bring a great crunch, carrots the pop of color and comforting flavor, lemon a bright and tangy pop of flavor, and cream cheese frosting is literally the icing on the cake! Using half whole wheat flour and half all-purpose flour was a good decision as you can't taste the difference or feel the change in texture. Things are always so much more fun when they're mini and single serving size! Rebekah's blog is Decadently Fit, where she focuses on a healthy lifestyle filled with great flavors. 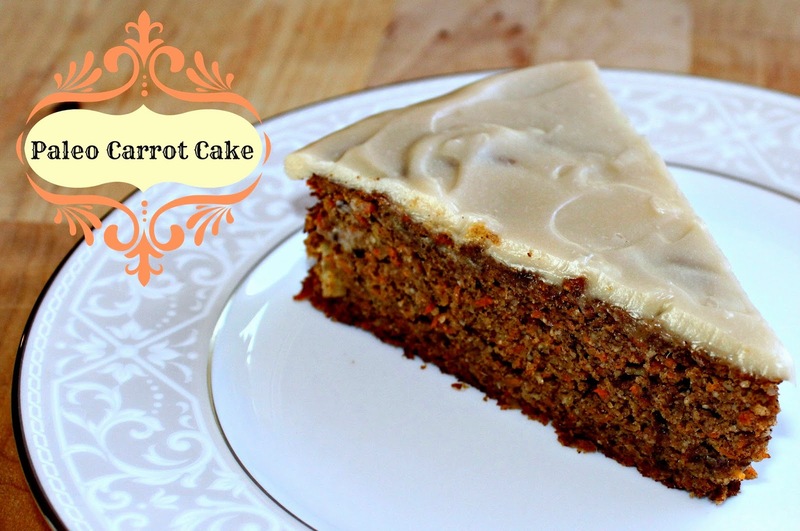 Hers is a Paleo Carrot Cake and looks just perfect! Jillian is the author of Food, Folks, and Fun and her baking skills are a force to be reckoned with. 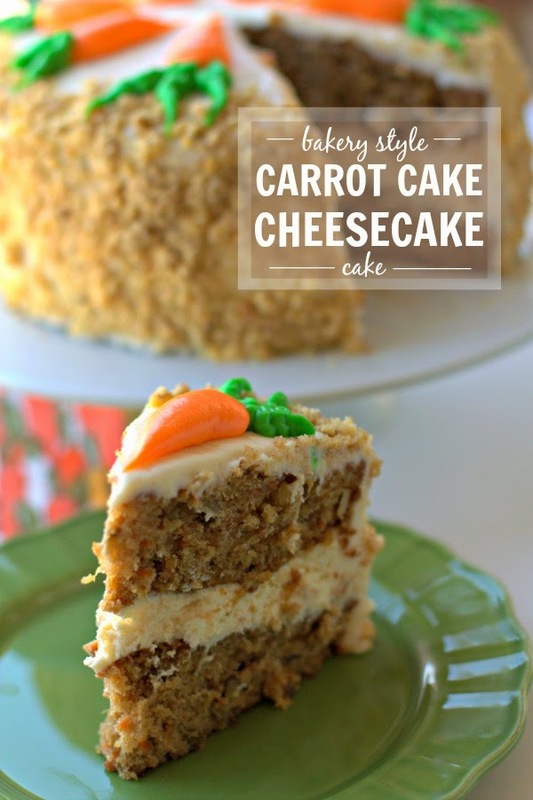 She's combined two classics with her Bakery Style Carrot Cake Cheesecake Cake and I love those tiny carrots on the top! Barbara Cooks is a true statement and the name of Barbara's blog! She's got a great perspective on food and life, having grown up in Indiana and moved to California, that I can relate to. 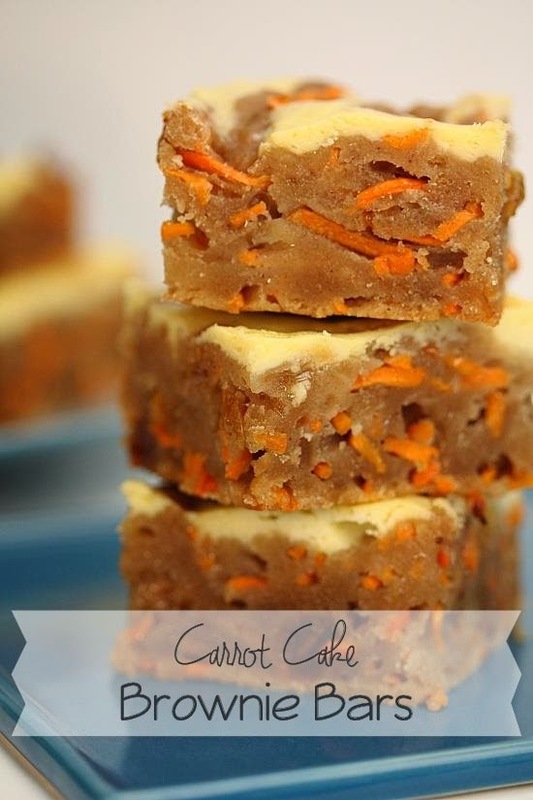 She made Carrot Cake Brownie Bars and aren't they gorgeous?! 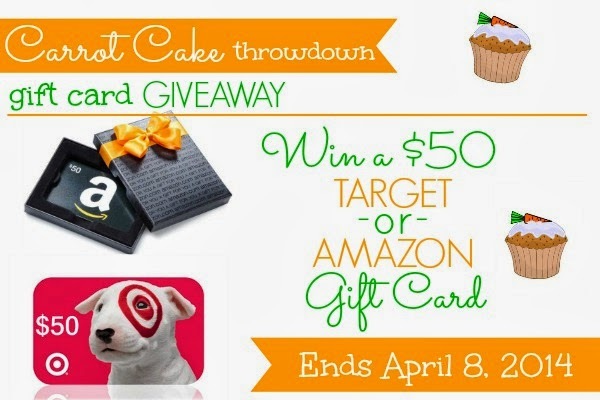 Well, friends and readers, not only do you get to enjoy all of our recipes and blogs, you also get a chance to WIN a $50 gift card through our carrot cake throwdown! Enter below and you could win! Consider it our gift to you to stock up on supplies for carrot cake baking. If you'd rather have those jelly beans and neon mallows, you can do that, too, these ladies don't judge :) Don't forget to like, follow, or subscribe to all of our blogs for more delicious goodness and recipes. Unfortunately I won't be meeting up with these girls at Camp Blogaway again this year, although maybe I'll finally post about last year's experience! I love that you used rainbow carrots for this recipe and that lemon peel sounds divine. These are perfect to take to a springtime party! Now I'm totally craving carrot cake! Brookie, I feel like you when I "just whip up something from scratch!" So yummy, but banana boats are better. There is not much that can top Banana Boats. Seriously. Those carrots! So beautiful! The thought of the lemon peel in this cupcake is making me drool. Penzey's! Pittsburgh shout-out. Great recipe and beautiful cupcakes! Katy I just sent my Mom to the Penzey's in Pittsburgh :) Thanks, this recipe is a keeper, for sure. I didn't realize that there's one in the Burgh!